First corner lies on the left hand side of the bay and is reached by a short boat trip. First, you dive with your left shoulder to a rocky slope descending to 25 metres. Right at the beginning of the dive, you are welcomed by swarms of monk fish. In autumn, you can often see schools of large mackerel here too. After about 10 minutes, you reach two cliffs which you can dive between, followed by a slope which descends 25 metres until it hits a sand bed. Here you can often spot turtles or rays. 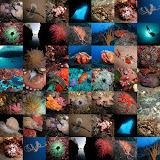 Next, you come to a cliff reef stretching 18 metres below the surface. The upper edge is decorated with clusters of nudibranches. On the return to the boat, there is another pretty overhang where you can slowly surface surrounded by shoals of hatchet fish.